My organizing or decluttering issue is the garden — I need to make the gardens a bit easier to manage as I get older. Some of it will be resolved by switching to services to do the work. In other places, it will be to simplify what I do. 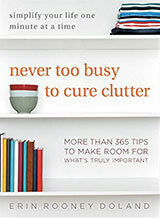 For my home, it is also about decluttering, organizing and getting ready for “aging in place.” I want my home to be easier to handle if I get a medical problem. For example, if I am going to update my kitchen or bathroom, am I making the right changes for an elderly person? Of course, in some cases, this advanced-age thinking does make it easier to get rid of things. Liz, it sounds like you’ve already got a good plan in place for the garden. But I do have the following organizing-related suggestions regarding aging in place. Many of these ideas could benefit a lot of people, not just the elderly, but they become increasingly important as someone gets older. From your comments, Liz, I think you are well aware of this. But it bears repeating because this step so often gets ignored. I recently read something about aging-in-place solutions that jumped right to installing closet organizers. Yes, that can be important — but the first step is uncluttering what’s in those closets. Once that’s done, you’re ready to consider those closet organizers. Place your lower cabinets six inches above the floor. You could also install pull-down shelving into existing upper cabinets. For lower cabinets, adding rollout shelves (or replacing the cabinets with drawers) can make things much more accessible. Anne-Marie Brunet on Next Avenue provides numerous examples of how lower cabinets can be replaced or redesigned. When it comes to the clothes closets, storage solutions that get the shoes off the floor are generally a good idea since bending becomes harder with age. Pull-down closet rods can make clothes easier to reach in closets where the rods are fairly high. And then there’s the bathroom. I never thought about adding a shower niche at shower-seat level until I saw that feature in one design. Some of the fanciest products I’ve seen are the Closet Carousel and the various offerings from StorageMotion: AutoPantry, ShoeSelect, etc. Most people will be satisfied with far simpler solutions, but it’s still interesting to see the innovative storage products that are available to keep things within easy reach. If you’re making a significant investment in remodeling your home, you may want to work with someone who has special expertise in universal design and/or aging in place. For example, the National Association of the Remodeling Industry has a Universal Design Certified Professional Program. After more than eight years of writing unitasker posts for Unclutterer (close to 400 featured products), I think it might be time to create a word or phrase specifically for unitaskers that are poor substitutes for knives (like knife-nots or uni-cutters or something along those lines). Because I sincerely believe that half the unitaskers we feature fall into this category. 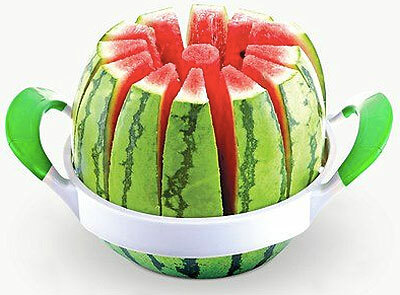 The Melon Slicer is about a foot in diameter, so it takes up a massive amount of storage space in your kitchen or pantry. Also, it has 12 blades on it — which is like having 12 knives in your drawer, eager to rip up your hand each time you want to retrieve something. And, as previously mentioned, it does exactly the same thing as a knife you already own. It also requires that you have a watermelon that will be smaller than the device and that the watermelon is shaped like a basketball. Yes, those watermelons exist, but they’re hardly the standard. Thanks to reader Monique for finding this enormous uni-knifer! For people who own smartphones, one of your phone’s benefits is that it can serve as your mobile computer when you’re traveling. To help facilitate this change in purpose, you may also wish to switch things up on your phone. You can make adjustments to the the apps on your home screen, the alerts your smartphone delivers, and more before departing for a trip. The following suggestions are what I recommend making to your smartphone while preparing to travel. Most of these apps have obvious functions: phone calling, web browsing, navigating, texting, listening to music, and shooting photos and video. The others have specific duties. Evernote is my database for everything digital. It lets me create and browse a fast, lightweight, and searchable repository of all the specifics I’ll need for my trip: hotel reservations, airport details, parking locations, confirmation numbers, and so much more are all a tap away. In fact, my “everything database” has all but eliminated paper from my travel materials. Path is a social networking application with an interesting premise: unlike Facebook and Twitter, which invite users to broadcast their comings and goings to whoever will listen, Path asks you to invite a handful of family and friends to share your favorite moments. I often use it with my family, most of whom also do a fair amount of traveling. Finally, I’ll add any destination-specific apps I find. For instance, there are several great apps available for navigating Walt Disney World. In 2011, Macy’s released an official Thanksgiving Day Parade app. Search your favorite App Store for apps related to your destination. Not every trip is a vacation. I often travel for work and when I do, my smartphone is in tow, as is a pile of other tech goodies, like wall chargers, cables, keyboards and so on. What’s more, I meet colleagues who also travel with gadgets, often identical to my own. To avoid confusion, I mark my own stuff for easy organizing. Stickers are impermanent, too, and I like that. Someday I might want to sell or give away some of my gear and no one will want it if it’s got “Dave Caolo” written on it in black permanent marker. The stickers are easy to remove and don’t leave any residue. While stickers work, they’re not always the most elegant solution. For something a little better-looking, consider Buoy Tags (or similar). These customizable plastic tags clip onto USB cables. You can add your own initials, name, phone number, etc. Tags like this are very handy. I’ll admit, I check email during trips with my family. However, I reduce the temptation to spend too much time on this app by making it less attractive. First, I disable the alert sound/vibration completely. Next, I disable the alert icon that appears whenever there is a new message. And finally, I move the app into a folder so it is more difficult to access and see. When I get on my phone to pull up a hotel reservation, I’m not lured into email–on, off, and back to my relaxing trip. Every Wednesday, we highlight a unitasker on Unclutterer. These humorous posts point out a product that does a single thing, and for the majority of people has little utility. Today’s post is about the opposite, a multitasker with high utility: the five-gallon plastic bucket. I have dozens of these, and I’d gladly take a few more. This unassuming little tool is about the most useful thing I have around my house. I believe every homeowner can find uses for several. They’re inexpensive, durable, and infinitely useful. The following are ways I use my buckets around the house for cleaning and organizing. Toting things around. Moving and holding things is a bucket’s obvious and primary function. Since buckets are highly durable, you can haul all sorts of things easily. Weeding. I always use a bucket when weeding the yard. The bucket is light enough to carry around and capacious enough to hold a lot of weeds, which allows me to spend more time weeding and less time running to empty the bucket. Painting. The buckets hold a lot of paint and have accompanied me on many jobs. Washing the car. This seems rather obvious, but they work great for holding sudsy water. Transporting small things. Small rocks, collections of toys the kids have strewn about the house, pretty much anything you need to move from point A to point B. Fire safety. We have a fire pit in the back yard. Whenever we use it, I have five gallons of water and five gallons of sand standing by in buckets. Should there be an emergency, I’m ready. This safety precaution also makes it quite easy to extinguish any hot embers as the night ends; much easier than fiddling with the hose in the dark. If you have an indoor, wood fireplace, metal buckets are great for holding ashes for a few days after a fire to allow the ashes to properly cool before disposal. DIY bird feeder. 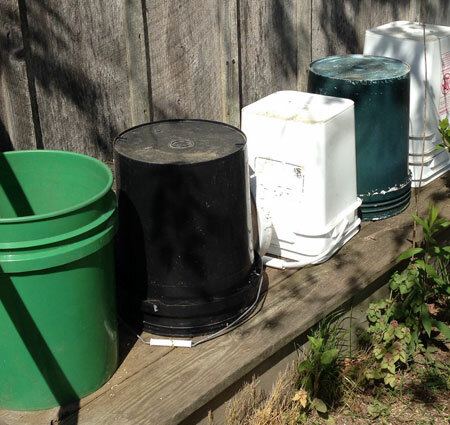 The kids and I line up a few buckets upside-down and pour a bit of bird seed on each bucket bottom. The birds love it and we have a great time watching the birds. Mixing. There’s no better mixer for calc, cement, sealant, and so on. Best of all, it’s got a handle, so it can come along with you. Camp seat/storage. My family goes camping a couple times a year, and our bucket “Sit Upons” always make the trip. They’re super simple to make: get some polyester stuffing, attach it to the bucket’s lid with decorative Duck Tape, and you’ve got a lightweight, portable seat that also carries your favorite camp items. Organizing your supplies. Add a few simple inserts into your bucket or pockets for the exterior and you’ve got a fantastic portable organizer. You can make a craft supply bucket or purchase tool supply pockets to fit on the exterior of your bucket. The sky is the limit. Be creative. If you’re really handy, you can apparently make a portable air conditioner that is perfect for a shed, workshop, and so on. You can even grow plants in them, like tomatoes. The point is, you can spend less than ten dollars and get a tool that you’ll have for years, is nearly indestructible, and is incredibly versatile. Don’t overlook the humble five-gallon bucket. My husband insists on keeping various things by his recliner, on a small table, in the living room. Things like scissors, nail file, pens and pencils, two pair of glasses, toothpicks, nail clippers, bottle of water, Kleenex, TV remotes, files he is working on (self-employed), electric razor, vitamins, crossword puzzles, scratch paper, his laptop, current book he is reading … need I say more? Actually it is an old TV stand that he has repurposed and it has a shelf where he slides the laptop into. And there is some organization to all of the things mentioned. Some aspects of the clutter can be removed easily when company comes over as they are in plastic shoe boxes. Do other women have this problem and what do they do?! Mary, the living room is a shared space, so it’s important to look for solutions that work for both of you. The following suggestions might help you find some common ground. It’s often wise to store things where they are used. So keeping some things by the recliner can be a good strategy for someone who regularly uses that chair to read, work on the computer, do crossword puzzles, watch TV, etc. But I’d suggest you negotiate some limits, based on what activities are appropriately done from the recliner. Unless your husband has a disability and getting out of the chair is a significant issue, I would think that personal grooming is better done elsewhere. So maybe a book, some scratch paper, a few pens, eyeglasses, and such stay by the recliner, while things like the electric razor do not. Once you’ve agreed which things are reasonably kept beside the recliner, consider whether it makes sense to invest in better ways to keep those items close at hand. 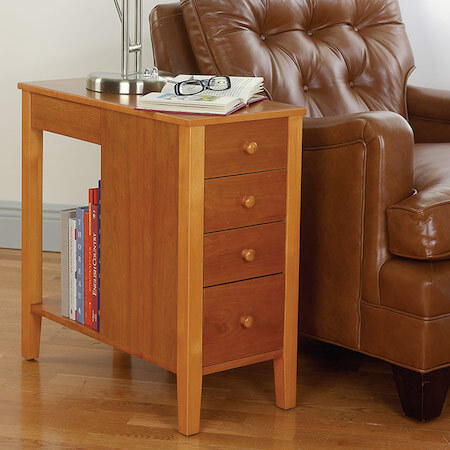 You might want to replace the old TV stand with an end table that provides storage, such as this one from Levenger. 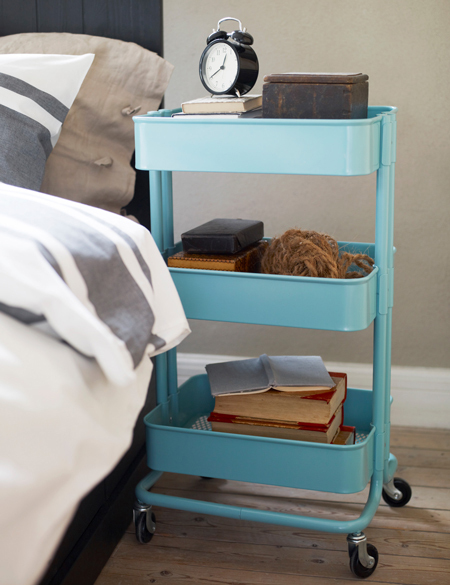 You could also add a storage ottoman. There are many choices, at various price points — the one above comes from Crate and Barrel. Another approach would be to make that entire furniture piece mobile, so it can be rolled away when company comes. For example, something like the above utility cart from Ikea could work. 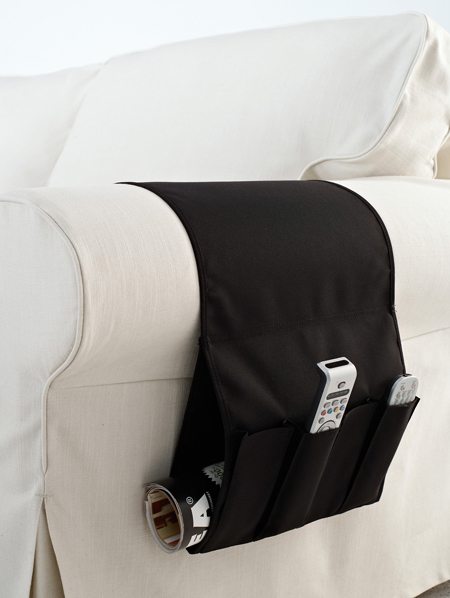 It might also help to add a storage product that goes over the arm of the recliner, such as the above remote control pocket from Ikea. Place any book that’s been finished either on the bookshelf (if it’s a keeper) or in whatever place you’ve defined for things being given away or sold. If anything has accumulated near the recliner besides the things you have agreed belong there, put those items away in their normal storage places. Put everything that does belong near the recliner in its designated storage area: in the drawers or containers on the side table, etc. Marie Kondo, who wrote The Life-Changing Magic of Tidying Up, would say that all your husband’s things should be kept in one place, not scattered around where they are used. If you want to follow her advice, I would suggest (as she would) that you begin by making sure your own things are in order and showing by example how well her approach can work. In case you can’t tell from the image, this is a washing machine specifically made for washing only your baby’s clothes. According to the product’s marketing, the reasons you need a special washing machine exclusively for your baby’s clothes and diapers are because your current washing machine doesn’t rinse detergent out of the clothes well enough (which might be true if your washing machine is from the 1970s and doesn’t have a second rinse cycle AND you have a baby with extremely sensitive skin) and your crappy washer doesn’t allow the water to get hot enough to sanitize your child’s clothes (which might be an issue for you if you’re using a detergent made out of germs instead of soap or not using a clothes dryer after using your germ-infused detergent or don’t have water temperature controls on your machine). Obviously, to fall for these ridiculous marketing points you must be in denial about the fact that your baby with super sensitive skin will eventually grow into a child with sensitive skin and then a teenager with sensitive skin and his/her clothing will need a normal washing machine much larger than this thing. What? I shouldn’t point that out?? Now, maybe I’m out of line, but if you have $600 to spend on a special washing machine just for your baby, isn’t it extremely likely you already have a super, fancy, full-capacity washing machine with the exact same specs and bells and whistles as this one but that everyone in your family can use? 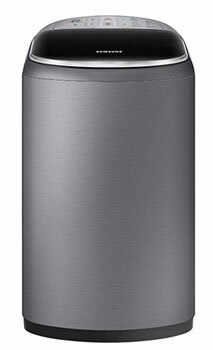 What is the likelihood that someone is willing to drop $600 on this device and doesn’t already own a high-end, deluxe washing machine? I’d say that likelihood is either zero or so close to zero as to be statistically irrelevant. Even “basic” washers have second rinse cycles and water temperature controls, and the “high-end” models even have things like disinfecting steam cleaning modes these days (which are great for pillows, by the way). Another thing that made me laugh about this unitasker was something I found on the official Samsung website. The product description stated: “Designed especially for your baby, this washer features powerful double-rinsing technology that minimizes detergent residue, protecting your baby’s sensitive skin.” The sentence structure is so poorly constructed that it seems as if you could wash your baby in the washing machine instead of his/her diapers. Oh, Samsung. Thanks again to reader Wendy for this unitasker discovery! A bigger home won’t solve your clutter problems, and the “perfect” house won’t curb your desire to buy more, more, more or transform your life. The real solution is to fix your relationship with your possessions and get things under control in your current living situation. Things from the uncluttering, productivity, and simple living worlds that are worth sharing. Dedicated furniture can help organize a music practice space. My … struggle is with the GTD method. I’ve read the book and I think it could work really well for me, but the required cleared-schedule, back-to-back two days to get started is so intimidating and too overwhelming. I don’t have the liberty to turn my life off for two days to work without interruption. How can I ease into this? I first discovered David Allen’s book Getting Things Done: The Art of Stress-Free Productivity when I was an IT Director at a residential school. That was a crazy job, as I was supporting about 80 computers, a network and more, including heading up the help desk for there school’s 100 employees. It was easy to feel overwhelmed and I often did. Fortunately, I discovered David Allen’s method. Adopting it in earnest took a lot of work, not just in my own behavior but in the materials I was using. I felt it was worth the effort, but I also realized how much effort was involved. Processing everything in my work life to get “clean and clear” took days. Personally, I recommend taking time off and completing the work as he suggests. I found it saved me time and frustration over the longterm. However, I know this isn’t realistic for everyone. Pick the area that’s most in need of attention and focus on it for as long as you can (two hours? four?). You might have enough time to get your desk/work area and your work projects “clean and clear.” Then simply “GTD” (if I may use it as a verb) that aspect of your life. 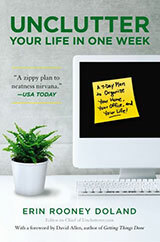 This will reduce the overwhelmed feeling and get you comfortable with the system, so that when you’re ready to tackle the next area, like that pesky garage, you’ll be an experienced machine. I do believe in David Allen’s method, especially in the very real feeling of being on top of everything that comes from getting “clean and clear.” I also realize that GTD is not the best fit for everyone. With that in mind, here are several alternative methods you might find interesting or appealing. If any of those five issues are ones you’re having with GTD, maybe Zen to Done is an alternative that could work for you. Another program is Asian Efficiency’s Agile Results. I’m not super familiar with this method, but it’s been popping up on my radar off and on for a while now. Like Leo’s Zen to Done, Agile Results is more goal-focused than process focused. It’s clever, and a part of a larger method of his Now Year formula. His alternate method might work for you. Getting on top of everything can be a chore, but it’s well worth the effort irrespective of what method you ultimately decide to adopt.